Welcome Jaguar Land-Rover of Windsor! We are the premier luxury dealership in the Greater Windsor area. 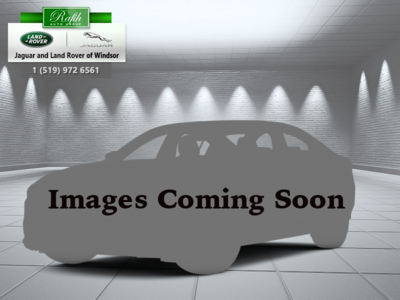 Top of the line Pre-Owned Land Rovers, Jaguars, Volvos, Audis, BMWs, and Mercedes are available. Friendly salespeople are on hand to help you find the car you deserve. Multiple on-site financing options and professionals are here to assist you. This Range Rover Velar takes chances in its exterior and interior and wins spectacularly. 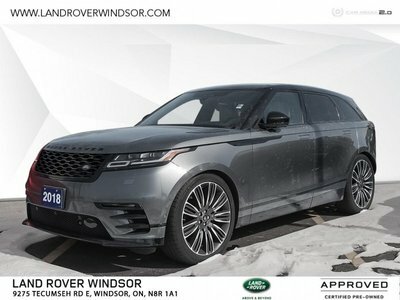 This 2018 Land Rover Range Rover Velar is for sale today in Windsor. All-new for 2018, this Range Rover Velar sets a new standard in compact luxury SUVs. It reaches a new dimension in glamour, modernity, and elegance with emotionally charged DNA and unquestionable design pedigree. Outstanding craftsmanship and materials adorn the interior to create a luxurious atmosphere unlike anything else. This SUV has 10500 kms. It's charqul in colour and is completely accident free based on the CARFAX Report. It has an automatic transmission and is powered by a 380HP 3.0L V6 Cylinder Engine. It has some remaining factory warranty for added peace of mind. 380HP 3.0L V6 Cylinder Engine - 0 cyl. Interested by the 2018 Land Rover Range Rover Velar HEAR ?